Household cleaners have become such an ordinary and everyday-use item that people generally don’t question the barrage of potentially hazardous chemicals that are found in abundance in these products. Developed as something that is intended to clean our home and protect us from bacteria and contamination, these products may actually be causing more harm than they are good! The ingredients found in many conventional cleaning products mean that our homes may appear to be clean but they may not be considered a safe and healthy environment at all. These everyday household cleaners contaminate the air with a mix of carcinogens, hormone disrupters, neurotoxic solvents, mood altering chemicals and reproductive toxins, leading Scientists to regard these household products as a serious source of pollution. According to the U.S. Environmental Protection Agency, the air inside the typical home is on average 2-5 times more polluted than the air just outside and, in extreme cases, 100 times more contaminated largely because of household cleaners and pesticides! 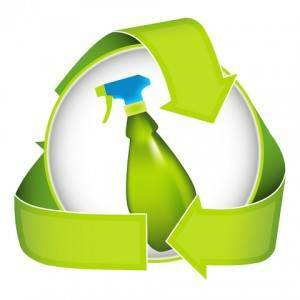 As our use of cleaners continues to rise, so too does the incidence of cancer, asthma and other illnesses. It is being suggested that our constant contact with chemical fumes and chemical residues inside our homes may be a significant contributing factor. In regards to household cleaning products and animal testing, more than 4,000 mice, rabbits, guinea pigs and other animals suffer and die every year in laboratory poisoning tests in the European Union alone. Many more animals are killed elsewhere around the world for the same reason. Even the widely condemned Lethal Dose tests can be used which involves exposing the animal to massive doses of a substance to determine what dose will eventually cause death. Luckily there are an increasing number of companies that are trying to produce cleaning products is a more responsible, ethical and safer way. This means that they avoid petrochemicals and chemicals such as chlorine bleaches, phosphates, optical brighteners and synthetic fragrances. These ethically-conscious companies also produce their products in a cruelty-free way, formulating their products using the 8,000 or more chemical ingredients that are already established as safe and therefore don’t require further testing.The ingredients these companies use are also more likely to be low-toxic and earth-friendly, meaning that they are better for humans and the planet at large. For more information on one Household Cleaning Company that we love and endorse, check out our interview with Pearl, the found behind RESPARKLE and check out your November Vegan Box for a little sample to try! How long has Resparkle been operating for, and what prompted you start the business? At the risk of sounding dramatic, what prompted me to start Resparkle was the 9/11 tragedy. Back then I was a rising star in the world of finance and I asked myself- if a plane came through my window right then, would I be happy with the life I led? The answer was a resounding NO! That was the moment when I knew needed to start a meaningful business that would make a difference in people’s lives and create a positive impact on the planet and global community. I say Resparkle is my calling because I strongly believe love and health starts in the home. Something as basic as a parent keeping the home clean and healthy is a demonstration of her love for her family. It is gratifying to know that Resparkle is able to help families create healthier and safer homes. What is the Resparkle philosophy? Resparkle’s philosophy is simply- we believe every one deserves a home that is a safe and healthy sanctuary. As we focus on our well-being through nourishing our bodies with organic wholefoods, it is equally important that we are mindful of the toxicity in our home environment. We hope to inspire everyone towards a more wholesome approach to health where we eat clean as well as live clean. What is the difference between conventional cleaning products, and the amazing products that Resparkle produce? 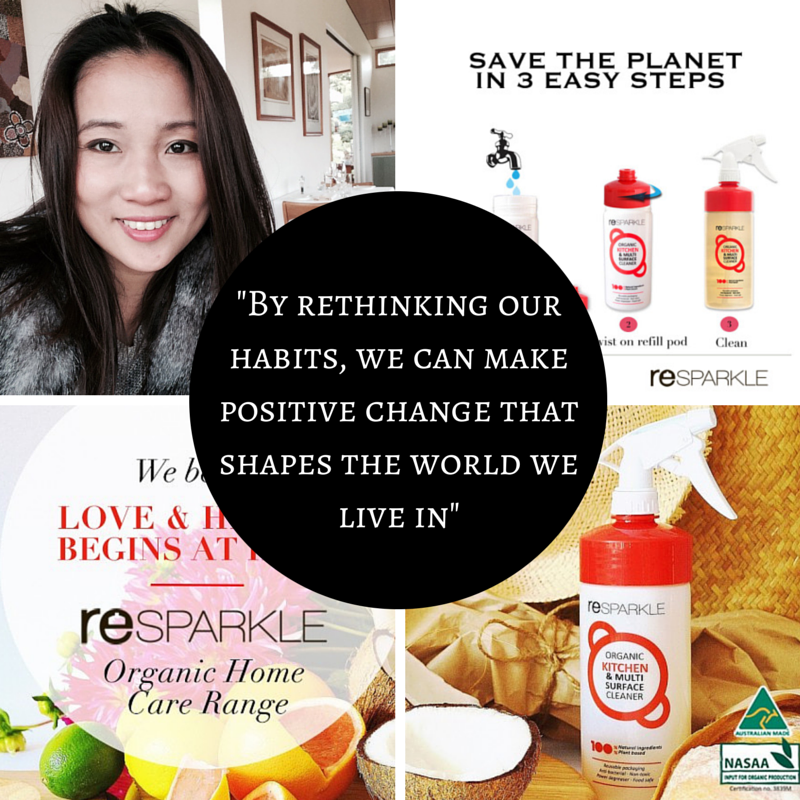 As far as I know, Resparkle is the only organic cleaning range available to consumers in Australia that is organically certified by NASAA. All our products are currently not only 100% natural and vegan friendly but also very affordable. Affordability is a big thing for us, as we want everyone to have access to a healthy home. To do this, we find innovative ways to reduce cost on unnecessary things like plastic packaging and only sell the active ingredients. But what really keeps our customers coming back is how well it cleans! Unfortunately, conventional cleaning products are driven by profit and due to the lack of regulations with labelling, they can get away with selling a cocktail of nasty chemicals. These nasty chemicals are absorbed through our skin and lungs and go directly into our bloodstream to our organs where they cause havoc. If you’re wondering whether the cleaning products you have at home are a keeper or a binner, the EWG.ORG website is a great way to find out. Simply enter the brand name and it’ll give you an independent rating of it’s toxicity. What is your favorite product in the Resparkle range? Picking one would be like asking which child is my favorite! But I would say the Organic Kitchen & Multi-purpose would be my most frequently used. I love cooking, especially Asian dishes and it can be quite a mess in terms of oil splatters & spilled sauces. I love how Resparkle cleans them all in just one wipe down without streaking and my kitchen ends each day smelling like freshly squeezed lemons! Oh hey there! I’m Hannah, an animal-loving vegan naturopath, based in Melbourne, Australia. I’m also the founder, director, and chief ‘boxer’ here at The Vegan Box. Thankyou for the info- I will be switching my cleaning supplies – That’s for sure ! !